Do you want to replace some bearings bushings on one of your machines but you are pressed for time? Probably the first thing you will do is to reach for a hammer and sockets. They will both give you the efficiency that you need at such a time but might not live to all your expectations. If you need proper installation or removal of close-fitting bearings and bushings, look for a better approach. For efficiency, a small arbor press may come in handy for you. The arbor press may turn out to be the ideal tool for handling motor shafts, bearings, and so on. For insights on the best small arbor press, read through. Here, you will learn of our editor’s choice, budget, and best value picks. Expect to read a buying guide too. What is An Arbor Press? Our editor’s choice for the best small arbor press is the HHIP 8600-0130 Pro-Series.... 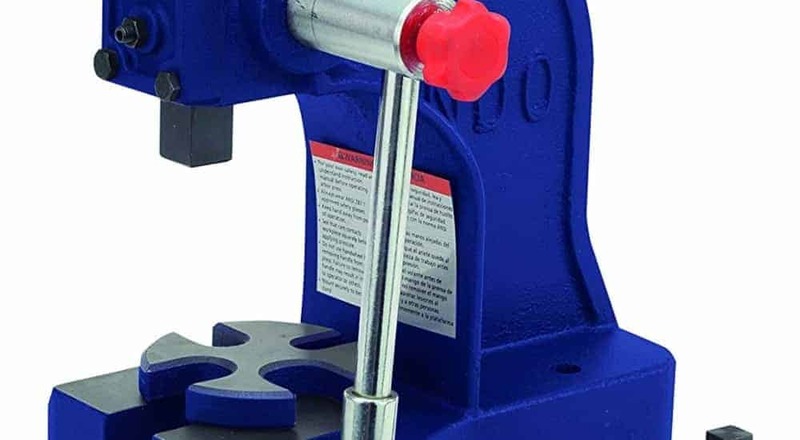 Featuring a 0.5-ton press and 11” press height, the tool is your ideal asset for squeezing, riveting, bending, punching, and other pressing applications. It is also designed with a drilled base which makes it easy to be mounted on a bench or pedestal for maximum ease of use. Capacity over the table: 4.6"
The H&H Products arbor press is designed to offer versatility while at it. This is because it is capable of riveting, punching, bending, squeezing, and other pressing applications as per the need. The tool also features a drilled base which makes it easy for mounting either on a bench or pedestal for maximum efficiency and per application. The product also promises the user of a prolonged lifespan with continued use, all thanks to its sturdy, cast-iron construction. To ensure it guarantees accurate work support in four slot positions, the product features a removable steel anvil. The H&H product also allows for punches and tools to be added to the end of the ram using a magnetic insert for increased versatility. Drilled base for easy mounting. Highly versatile for multiple uses. At 20lbs. (9kg), it is considerably heavy for people who are constantly on the move. The Central Machinery product features a 1-ton press which ensures to match the needs of the user with each application. The tool also features an all-metal housing which ensures it is sturdy and durable for consistent use. The product is also designed with mounting holes which ensure it sets up quickly and easily. With a maximum force of 2000 lbs., the arbor press maximizes results and makes it easy to handle smaller productions with ease. Rack and pinion-driven reversible ram. The PanaVise 502 Precision PanaPress features a 1/4 ton of pressure which makes it fit for both industrial and general tooling and repairs. The product also features a reversible ram which applies up to 1/4 Ton and 500 lbs. of pressure thereby balancing its power with the application. The tool is also designed with a ram that has 0.251” reaming on one end for adding tooling. With four adjustable nylon gibs, the user also enjoys exceptional ram control. The gibs also allow the user to make precise adjustments with minimal play. The product is also designed with a base footprint of 3.7" X 7" (or 94mm X 177.8mm) and four countersunk holes at the corners. These features allow for comfortable bolting of the tool to a work surface. In addition, the tool has two extra pre-drilled and tapped holes which increase the ease of mounting retrofit kits on the base. Compatible with a range of tools. Only fit for medium to light duty pressing. Reversible ram with a magnetic hold on one end. Lockable, fined and adjusting screw. Pre-drilled base for easy and quick mounting. 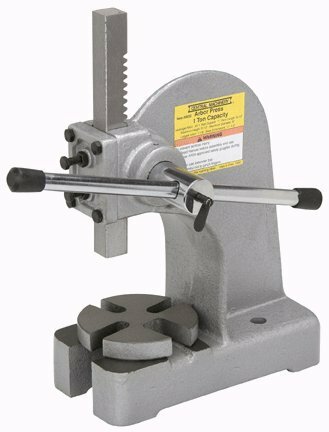 The Palmgren AP05 arbor press is designed to guarantee versatility since it can be used for a wide range of DIY and professional tasks like punching, bending, and riveting. The tool is also designed with compact dimensions which allow for easy portability. The product features a solid cast-iron housing which protects it from corrosion when used in a harsh environment. Even though the product is a manual press, it is designed with a hydraulic steel ram which helps to exert the needed pressure per application. The addition of other tools and punches is made easy for this arbor press since it allows for magnetic insertion on one end of the ram. The tool also features a pre-drilled base which makes for easy mounting on any work surface. Compact design allows for enhanced portability. Durable construction made of heavy-duty solid cast-iron. Punches often fall out of place. The iron housing is prone to rust if exposed to moisture or other rust agents. The HHIP 8600-0032 arbor press features an accurate depth limiter of the ram stroke which ensures the user can limit the depths to fit the application and also get finer measurements. The tool also boasts of a heavy-duty cast-iron housing which gives it strength and durability. The HHIP 8600-0032 device comes with four position steel anvils which enable it to support different types of workpieces. The ram control of the HHIP press is also designed to offer the user a smooth operation and increased accuracy. The HHIP 8600-0032 press is also designed with versatility in mind and for multi-users, since it can be used for squeezing, punching, and other pressing applications. Easy to set up and adjust. Only fit for light or medium pressing duties. ​Among the power and hand tools that one can reach for to perform small range tasks as installing, riveting, configuring, staking, and removing bearings is an arbor press. This is a versatile tool that can be used by both professionals and DIYers and on any surface which increases versatility. It can also be mounted on a wall, pedestal, or workbench for improved efficiency. 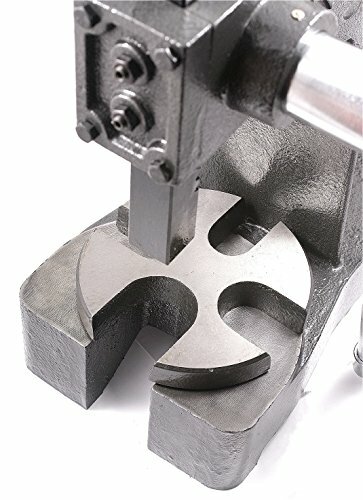 An arbor press is a small hand tool used for smaller tasks like pressing and removing bearings and other press fit tasks. The tool can work as it is or with the addition of inserters, punches, or other tools and dies to the end of the ram. This is however dependent on the task at hand. An arbor press is somehow similar to drill presses but smaller. An arbor press is typically rated depending on the maximum load it can apply. A typical presser has an average of 1-5-ton presses with its leverage achieved by applying force to the lever arm or wheel. The build of a press usually consists of cast metal while a ram provides the force. The ram is in return mostly driven using a rack and pinion setup which improves the mechanical advantage. A higher force arbor usually has another gear reduction system with their forces usually generated by hydraulic or manual inputs. Start by removing the handle by first loosening the knob. Remove the cap from the handle assembly and then remove the handle from the pinion. Disassemble the pinion retainer by backing off the set screw and then slide the pinion retainer off from the pinion. Pull the ram up and remove it from the press and then turn it end-for-end. After you change it, repeat the steps in reverse. Periodically ensure to lubricate it with light machine oil. Vacuum or wipe off the accumulated dust or debris after use. Check the ram side-to-side and front-to-back periodically to check for any parts that need tightening or adjusting. For most people purchasing power tools and other major machines, the major challenge is always in picking the right one. The same case applies to picking the right arbor press and may even play harder for amateurs or first-timers. However, asking yourself the following questions may help you to choose and settle for the best. One of the top considerations is the application you need the press for. Different applications would demand different presses based on their specifications and features and should guide you on what to go for. For instance, jewelry and leather workers would require a different ton presser compared to what a home mechanic would pick. The other aspect is the size of the workspace that you have. Since every presser has a specific size measurement, you should be aware of what size your space can take. As such, you should take the measurements beforehand and buy the press that will fit perfectly and for longer. The throat space is the space between the ram and main body and determines what the tool can be used for. While making the shopping decision, you should ask yourself whether you need a larger or small smaller throat space. The decision here is based on how large the workpiece will be especially for things like gearboxes or large hubs. The application you have at hand will determine the tonnage to go for. The ton of the tool should be one that fits the application without the need for constant shifts from one tool to the other. Also, you can consider a press that allows for tonnage adjustments. The number and value of accessories you can have for the press should also be among your key considerations. Such accessories include reversal switches, election cylinders, knockouts, die cushions, and servo systems for consistency, preciseness, and stroke controls. The other considerations include frames, horsepower, and speed. You can also base your decision on the maximum system pressure, the diameter of the cylinder, as well as how it is constructed. We feel that the HHIP 8600-0130 Pro-Series... makes it to our editor’s choice position as the best small arbor press. The HHIP-8600-0130 arbor press features a high-quality pinion machined using the latest technology. With the technology and expertise put into use to design it, the powerful pinion, and ram combination, the tool guarantees a strong yet quiet performance. If the budget is calling the shorts, the Central Machinery 1 Ton... would come in as a budget pick. It features a 1-ton press, 1" ram, a maximum diameter of 8", and a maximum press of 5-1/2" to fit the intended application. Our best value pick, the PanaVise 502 Precision... follows if your budget is not tight. It is designed with a 1/4-ton press, 1/4-inch ram, an 8” maximum height, and a diameter of 5-7/8” for both industrial and residential tooling and repairs. PRO-SERIES 1/2 TON ARBOR PRESS (8600-0130) - H&H Industrial Products, Inc.
1 TON HEAVY DUTY ARBOR PRESS (8600-0032) – H&H Industrial Products, Inc.